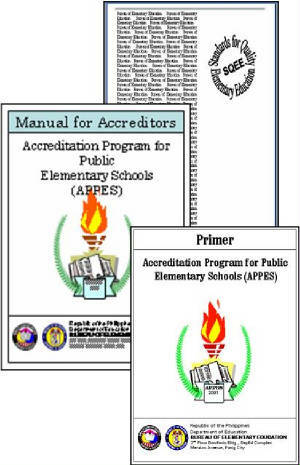 The pilot implementation of APPES ended in 2004. Nine (9) pilot schools underwent the formal survey of the national accreditors. Of the nine schools, eight (8) were awarded Level 1 accreditation while one (1) schools was recommended for a resurvey. In September this year, a national orientation participated in by 104 DepEd personnel at all levels was held. Copies of APPES materials such as the Manual for Accreditors, primer and instruments were produced and distributed during the orientation.